Thanks to Mashable for drawing my attention to this new campaign for the launch of the new sassy Virgin America safety video. Here’s 5 reasons why I like the video from a marketing perspective and why I think it “works” – not only for the purpose for which it was designed, but the clever leverage of social media. Hands up who hasn’t zoned out during a in-flight safety demonstration. The attendants have a job to do and the airline has a (legal) responsibility to make sure they convey the information. However there’s no law that says it has to be boring! 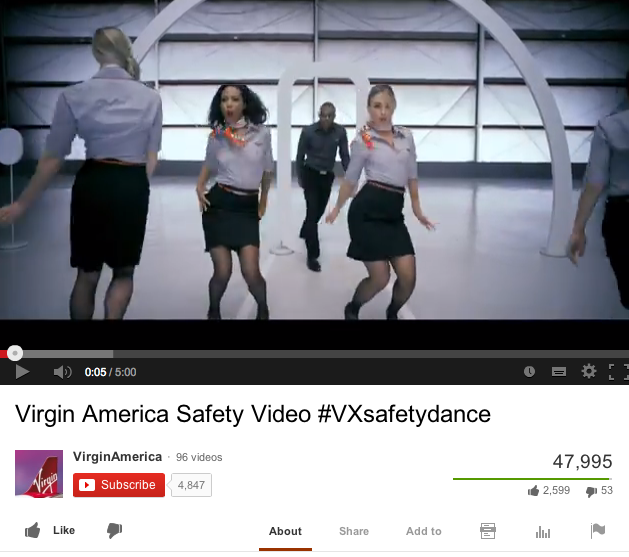 This same video is probably shown on every Virgin America flight. Unlike having just a couple of “trendy” staff who may entertain passengers on a few random flights with a fun in flight message (which has happened, have you seen viral messages about one doing a rap version?) this video ensures that every single Virgin America passenger gets an identical message. Sure, how they interpret that experience will vary, but chances are high that everyone who sees it will (either consciously or subconciously) translate this brand message Virgin has carefully engineered to reflect the brand as being fun, innovative and different. I would confidently bet that in the planning stages of this video, it was never expected to only be seen by passengers in flight. This type of production is designed to be shown and spread online. From posting the video on their YouTube channel, to creating a supporting message and hashtag, it’s expected and encouraged that this campaign will be picked up and spread via social media. As I type this, at 9pm Dutch time on Tuesday 29th October, the video was uploaded 11 hours ago on YouTube and already has had 47,995 views and 2610 “thumbs up”, 53 “thumbs down” and 264 comments. How many has it had when you view it? If this inspires you, then YOU, yes YOU can get involved. Sharing it online, or even – AUDITIONING for the next version!! Yes, that’s the world of social media these days – if you love something, it’s usually not that difficult to take the next step and get involved – or even be IN it. As would be expected from a big brand, the whole campaign is slick and cleverly integrated across all major social media channels. 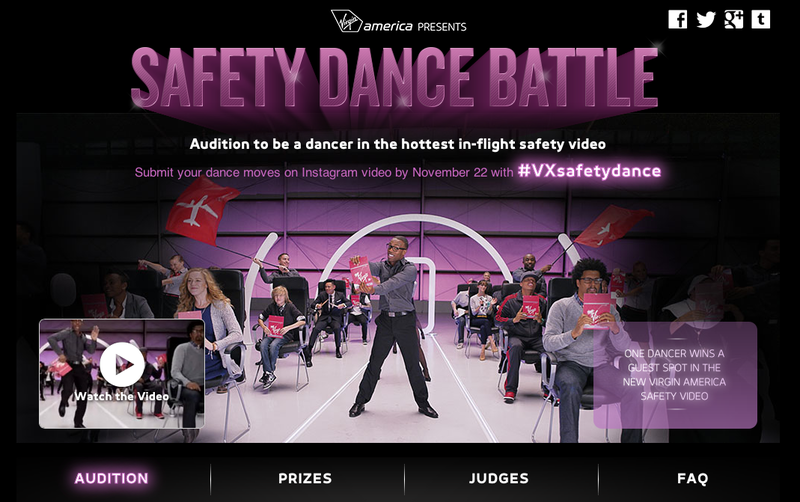 There is a dedicated website, a Twitter hashtag (also relevant across other social media channels) #VXsafetydance, icons to connect and share, and your own videos can be submitted via Instagram. So maybe you don’t have the budget of Virgin to launch your next campaign, but this social media case study analysing what makes it work may give you some ideas to apply the same techniques to YOUR business.